The food at Nando's isn't your standard fast food fare. The Portuguese food at this eatery is made using the unique African Bird’s Eye Chili or PERi-PERi. There are plenty of healthy ingredients on the menu. But can you get a complete diet-friendly meal when you eat there? It is possible to maintain your healthy eating plan when you eat at Nando's as long as you follow a few guidelines. Healthy eaters will find plenty to enjoy at Nando's. Menu nutrition facts are available online so it's easy to evaluate and choose foods that are good for you. If you check the menu before you go it will help you to make smart choices when you enter the restaurant. Grilled chicken is the cornerstone of the menu. 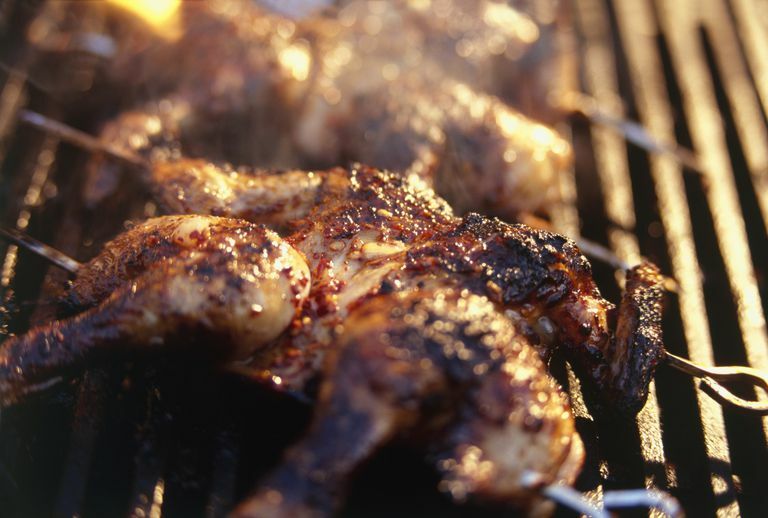 The chicken is marinated for 24 hours, then basted and grilled according to your flavor preferences. You can order the food as mild or as spicy as you prefer. And even though the chicken is full of flavor, it is lower in sodium than most chicken dishes that you find at other comparable restaurants. If you are trying to lose weight, eating spicy food may boost your program. First, there is some evidence that hot food boosts your metabolism slightly. Although, the extra calories you burn from a super spicy dish are not likely to be noticeable on the scale. However, choosing spicy food may also help you to eat less. It's a little bit harder to overeat when your food is drizzled in chili peppers. If you're not a fan of grilled spicy chicken, there are other items on the Nando's menu that you might enjoy. There are wraps, sandwiches, and salads (all made with chicken) and several vegetarian dishes like the Veggie Burger, the Roasted Veggie Wrap or the Portobello Mushroom with Halloumi Wrap. Side orders are also available on the Nando's menu. While the choices go beyond standard fast food fare the side dishes are still relatively high in starchy carbs. Diners can choose from choices like Red Skin Mashed Potato, Portuguese Rice, Garlic Bread, and a mayo-based cole slaw. If you want to keep your calories in control when you visit Nando's, keep an eye on your portion size and on the spice level that you choose. Nandos menu nutrition varies based on the way the food is prepared. While spicy food does provide some diet benefits, the more flavorful marinades are also higher in fat and calories. When you order your chicken, you'll choose from one of these spice levels. So how many calories are in a typical chicken meal at Nando's? Here's the nutritional breakdown for the most popular dishes. Each listing below is the nutritional information for a single serving. The 1/4 Chicken Leg and Thigh with medium spice provides 174 calories, 12.1 grams of fat, 3.1 grams of saturated fat, 0.2 grams of carbohydrate, 15 grams of protein and 93.5 milligrams of sodium. The Chicken Thighs with medium spice provides 290 calories, 2.1 grams of saturated fat, 11 grams of fat, 0.2 grams of carbohydrate, 45 grams of protein and 327 milligrams of sodium. The Chicken Thigh Skewers provide 310 calories, 2 grams of saturated fat, 9 grams of fat, 8 grams of carbohydrate, 46 grams of protein and 196 milligrams of sodium. The 1/4 Chicken Breast and Wing with hot spice provides 300 calories, 18 grams of fat, 1 gram of carbohydrate, 29 grams of protein and 123 milligrams of sodium. Each grilled chicken entree can be ordered with one or two side dishes. Here's how the nutrition for Nando's sides stacks up. Flame Grilled Corn on the Cob will add 90 calories, 1 gram of fat, 17 grams of carbohydrate, 3 grams of protein and 14 milligrams of sodium to your meal. PERi chips (fries) will add 373 calories, 24 grams of fat, 24 grams of carbohydrate, 4 grams of protein and 682 milligrams of sodium to your meal. The Portuguese Roll will add 210 calories, 1 gram of fat, 42 grams of carbohydrate, 8 grams of protein and 470 milligrams of sodium to your meal. And an order of Portuguese Rice will add 319 calories, 3 gram of fat, 64 grams of carbohydrate, 7 grams of protein and 97 milligrams of sodium to your meal. If you are trying to keep your calories as low as possible at Nando's order the 1/4 Chicken Breast & Wing with no added spice (called "plain...ish") and you'll only consume 260 calories and 14 grams of fat. The Chicken Breast is also a relatively healthy option, but it is grilled and served with the skin on. If you order yours with no added spice you'll consume 419 calories and 22 grams of fat. But if you remove the skin, you'll cut your calories and fat intake significantly. Then keep your side dishes small and smart for a healthy meal. Avoid dishes like garlic bread or potatoes and get the corn on the cob instead. Even though most of the menu items are fairly healthy at Nando's there are a few options to avoid if you are trying to reach or maintain a healthy weight. The Double Chicken Breast Wrap and Chips provides 1065 calories, 8 grams of saturated fat, 38 grams of fat, 101 grams of carbohydrate, 74 grams of protein and 1586 milligrams of sodium. The Nandocas' Choice with medium spice (a whole butterflied Peri-Peri chicken breast served on garlic bread topped with coleslaw) provides 1014 calories, 15 grams of saturated fat, 54 grams of fat, 52 grams of carbohydrate, 75 grams of protein and 929 milligrams of sodium.